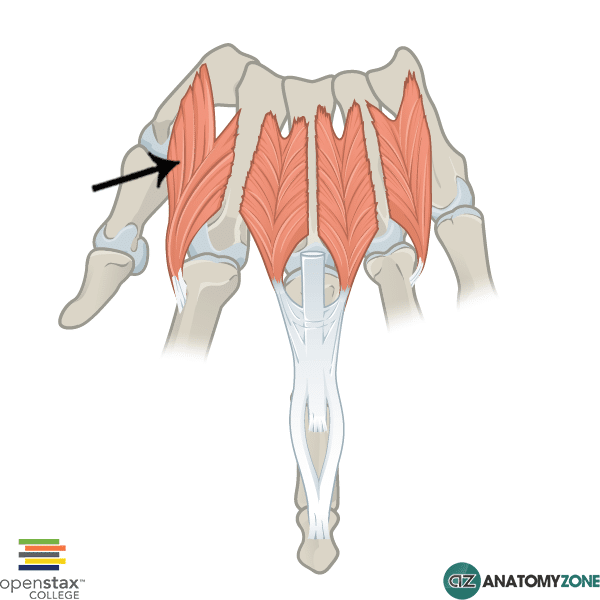 The structure indicated is the first dorsal interosseous muscle of the hand. The interosseous muscles, as the name suggests are located between (inter-) the metacarpal bones (-osseus). There are 4 bipennate dorsal interossei located between the adjacent shafts of the metacarpal bones and insert onto the bases of the proximal phalanges and the extensor hoods. The dorsal interossei serve to abduct the fingers away from the central axis of the middle finger. The first interosseous muscle inserts onto the base laterally on the index finger. The palmar interossei in contrast are unipennate in structure and function to adduct the fingers towards the central axis of the middle finger. A useful mnemonic for remembering this function is PAD and DAB: Palmar interossei AD-duct, Dorsal interossei AB-duct.